Posted 2/4/2015 6:42pm by Eugene Wyatt. 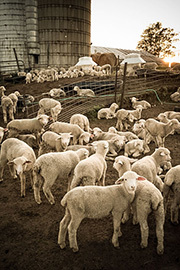 The lambs are one color; the difference you see is wetness of the wool; when sheep sleep out-of-doors their body temperature of 103F melts the snow beneath them. It has been below freezing for about 2 weeks; the snow doesn't melt, it drifts with the wind. With the 45 hp tractor we can't get to 2 round bale feeders to feed hay because of the depth of the snow. 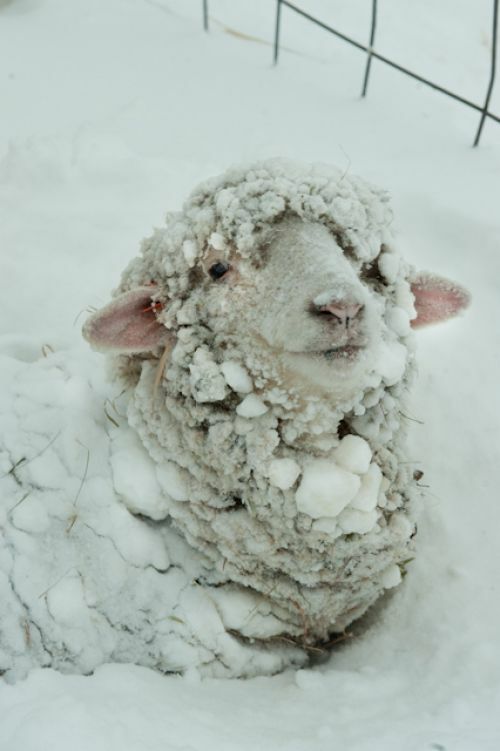 This cold weather is fine for the sheep—the lambs cavort and gambol in the snow—but things become expensive for the shepherd; we fed a bale without a feeder—the hay goes faster—but no matter the expense, you must care for your sheep; listen to Bob Dylan sing you Gotta Serve Somebody.